How to Protect Social network Account From Hacker . Social networking site like Popularity among People are growing like Rockets speed , Also involvement of hacker in Social networking site also grown up because social networking site is a hub people and peoples information , Social networking site is like weak door for those people who shows some laziness regarding Social networking website usages and their profile security , Giving hackers open invitation to steal there account information .A little awareness and security tips about social networking account can helps you to keep hacker away . 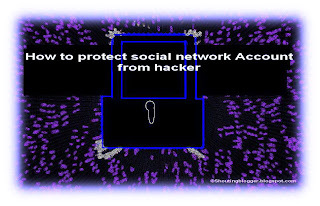 In this Article we will help you to defend your Social networking account against hacker by blocking his/her access key to your account . Use Complex Passwords then simple passwords . Avoid Login to social networking site by clicking suspicious links . Some of the hacker uses Phishing url to access login passwords and information . Phishing url are generally embedded on website , forum ,blogs etc which contains Redirecting script which actually stores information which you type by going through Phishing url . That's why you should always log in to your social networking account by typing full Social networking website in your browser instead of visiting login section through any blog , website and forums etc . Change your social networking account password regularly . Although you have a complex password for your social networking account but some time even these complex password is of no use , when some one see you typing your passwords , Sounds funny ? Kind of ! Some stats shows that Some people even didn't notice that there account got hacked and hacker use that hacked account without knowledge of yours . That's why it is recommend to change your social network account password on regular time interval . Clear browsing data when you leave pc . Avoid Sharing your password with your Friends . Most of the teenager do share there Social networking sites account with each other for fun sake , But sometime this fun cost you by losing your Social networking account , not because your friends would hack your social networking account or changed its passwords , Way of using other's people account is different for different people , he/she might accidental disclose your account with other friends etc. one more reason to avoid sharing Social networking site password is simple ,Suppose your account got hacked by some hacker then you would be blaming your friends for cause due to which your friendship will be in danger .